The hutongs came into existence in the Yuan Dynasty (1271-1368) when Kublai Khan (first emperor of the Yuan Dynasty) founded Beijing as the capital. In the residential area, all closed courtyards were built in a neat layout, and the lanes served the purpose of going around. During that period, they were all 9.3 meters (30.5 feet) in width which let the sunshine in all the year round. In the later dynasties, small ones were formed within the existing lanes, as a result, hutongs now vary in width and length and some even have many turnings. The Qianshi Hutong in the Qinamen Area is only 40 centimeters (16 inches) at its narrowest. It certainly poses a challenge for a plump man. 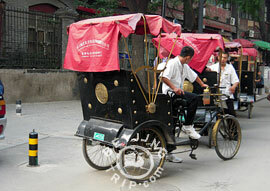 The Jiudaowan Hutong has more than twenty turnings where even the locals can get lost, let alone foreigners. Even if you have a very good sense of directions, you may not well manage without consulting the signposts. Most of the hutongs run from the due east to west or from the north to south, thus forming the neat layout of the city. In order to allow the main house to get more sunshine, the courtyards were all built facing south, so hutongs running east to west are superior in number. But there are also slanting hutongs which are always overshadowed. Hutong has become a general name for all the lanes and streets in Beijing. Recent record shows that there are over 6,000 hutongs. The ancient hutong area takes up most of the urban district where one third of the people living in the urban area reside. The residents there retain their old way of life and deem hutongs as an indispensable part of Beijing culture. During the urban transformation of recent years, some of the ancient courtyards have been replaced with skyscrapers, and some hutongs subsequently have now disappeared. Fortunately, a lot of the important hutongs have been preserved as a cultural relic. 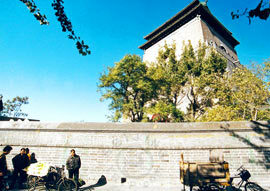 A Hutong Tour is now very popular in the Shichahai area (Xicheng District). Sitting in a pedicab or a boat, you can visit courtyards of both former aristocrat and local people who are happy to chat to you about their life. hi we are going to visit beijing and how much does the rick saws cost? Hey guys I like the third photo. Is there any place in australia where I could find a map of some major hutongs? Or a list of the most famous?